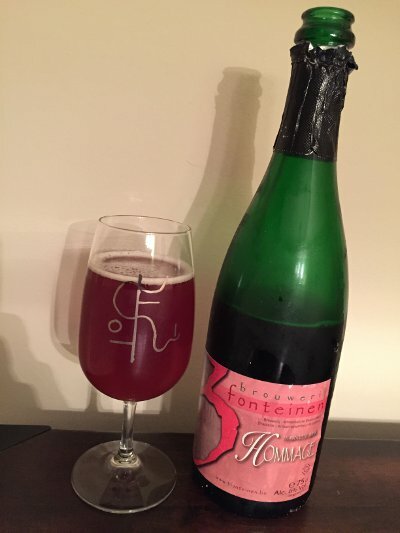 A couple weekends ago, I celebrated my birthday, and with it, uncorked a few prized possessions including this hallowed lambic from Drie Fonteinen, a blend of lambics aged on mostly whole raspberries from the fabled Pajottenland, but also includes some cherries and probably some other twists and turns. They don't call Drie Fonteinen's Armand DeBelder a master blender for nothing, and this beer was made in honor of his late father, Gaston DeBelder, so you know Armand went all out with this one. They've only made this twice, once in 2007 and once in 2013. I figured 8 years was enough aging for this one and dug into that first. It did not disappoint. Beer Nerd Details: 6% ABV bottled (750 ml caged and corked). Drank out of a flute glass on 9/13/15. Bottled: 14/02/2007. Wales, bro. Well that was impressive. 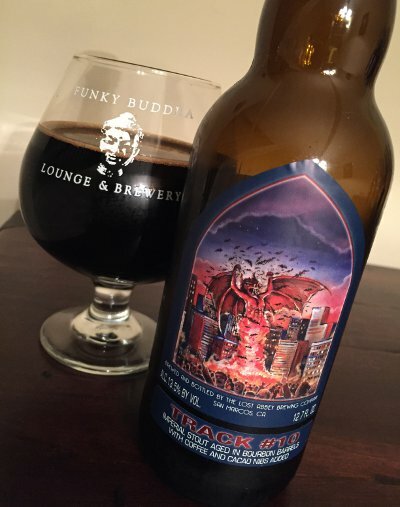 After this one, I cracked a 2012 BCBS, which was holding up exceptionally well. Let's just say it was a good night. I actually have a 2013 vintage Hommage that I may have to hold onto a little longer, but I'm betting it will be opened sooner rather than later. I love these lambics, but they're a bear to get ahold of these days. Even Kaedrin secret Tilquin is starting to disappear from shelves these days. I have a couple Drie Fonteinen Gueuze in the cellar as well, and hope someday to try some of their other stuff. 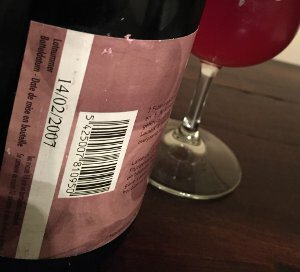 Cantillon has the reputation for better fruited lambics, but if this beer is any indication, they're basically on the same hallowed field. Avast, ye bilge rats! Come witness mine grog tastin.... ok, I can't really keep that up. Speaking in what I'm sure are apocryphal and historical dialects is just not my strong suit, even if last Saturday was International Talk Like a Pirate Day (more appropriate for me would be something like "I don't feel like paying for Photoshop." anyway). Plus, I drank this on Friday night not even realizing that Saturday was that most hallowed of holidays. I'm the worst. No, wait, what I am I talking about? You're the worst. Why are you giving me crap about not drinking this beer on a ridiculous, made-up "International Observance"? You are totally the worst. Instead, I celebrated World Water Monitoring Day by drinking fermented sugar water aged in barrels previously used to store fermented Jamaican sugar water that was then distilled. I monitored the hell out of my water intake on Friday, rest assured. Beer Nerd Details: 12% ABV bottled (12 ounce). 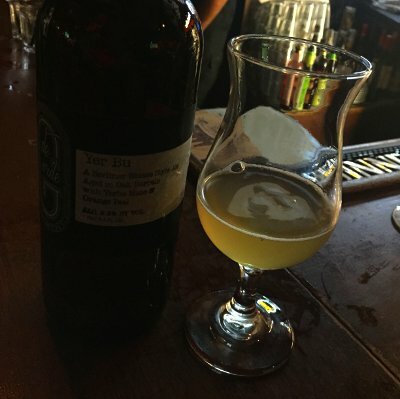 Drank out of a snifter on 9/18/15. Bottled 18815 (so that's 7/7/15, not sure which batch, but this is long after they stopped waxing the bottles). 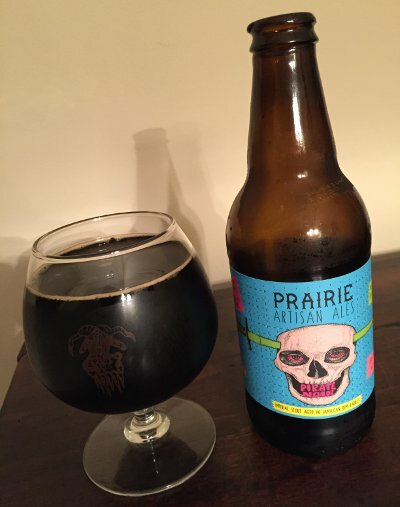 So perhaps I should try more of these barrel aged Prairie beers, eh? I've got another one in the pipeline somewhere, so look out for that, but what I really need to find is a Prairie Pirate Bomb! Beer Nerd Details: 5.5% ABV canned (16 ounce pounder). 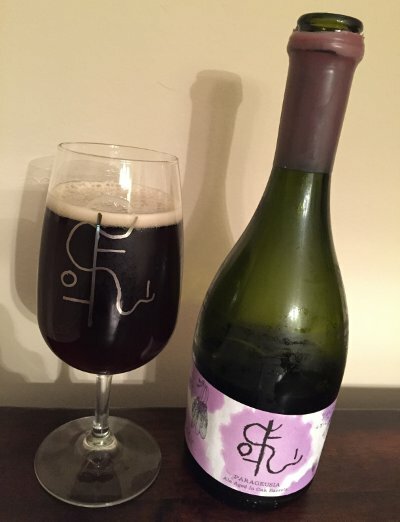 Drank out of a tulip glass on 9/18/15. Canned on 7/13/15. Many thanks to Jay of Beer Samizdat for sending this one along. Modern times as a pretty great line of beers. 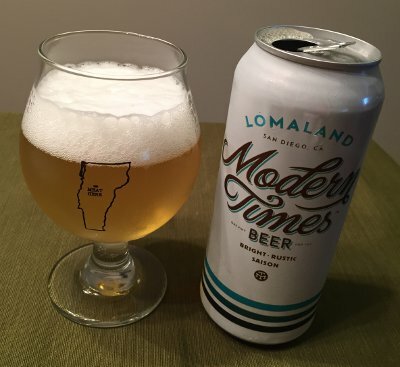 I'd love to get my hands on some Funky Lomaland (basically this beer dosed with Brett and aged in wine barrels) or the BA variants of Monsters' Park. 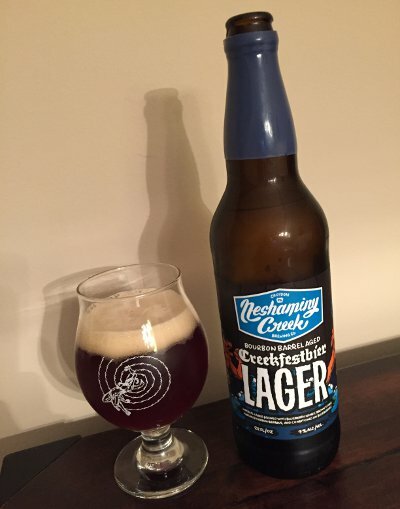 Beer Nerd Details: 9% ABV bottled (22 ounce blue waxed bomber). Drank out of a tulip glass on 9/11/15. Vintage: 2015. I feel like this is a more successful barrel treatment than BBA Leon and I found it really enjoyable (I would like to try a non-blueberry version though, that tart note works fine here, but it might be even better without that...) Next, I need to get my hands on, well, pretty much all of their other barrel aged treatments... and I'm sure a Punkless Dunkel will make its way into my house this season as well (even if you're not a big pumpkin beer person, that one's worth trying). Beer Nerd Details: 13.5% ABV bottled (375 ml caged and corked). Drank out of a snifter on 9/6/15. Pumpkin Beer in July! Every year with these people. Yeah, it's faintly ridiculous that a big, heavy, spicy fall beer shows up on shelves in July, and no, I don't want to drink one whilst embroiled in a humid heat wave. That's why I don't buy pumpkin beers in July! No one is forcing you to buy them and there's plenty of other stuff on the shelves. We're drowning in a glorious deluge of great, varied beer these days. I can't get worked up about pumpkin beer showing up a little early. The definition of Craft! Dear lord, why? It's fermented sugar water, and it's delicious. That's pretty much all I need. Look, I enjoy pedantic labeling exercises as much as the next guy, and if you want to see me rant about what the hell constitutes a saison, I'll go on about it for hours. That is something I can get worked up about, for some reason. But "craft" is basically meaningless to me, no matter how you define it. I'm sure I've used the term on here before, but the thing is, you probably understood what I was talking about without needing to delve into how many barrels a given brewer puts out in a year. Language is sometimes ephemeral, and I have a hard time getting worked up about the definition of craft. In certain contexts (i.e. if I worked for a trade organization dedicated to a certain group of brewers), I'm sure it's super important, but I don't exist in such a context. Malty and Hoppy are lazy descriptions! And yet, non-beer-nerds seem to get it right away when I use those words. When I say biscuity or bready, they turn their head at me the way a cat looks at their owner when the food bowl is empty. I'm not trying to dumb it down or condescend, but I also don't want to lecture someone on the minutiae of malt and hops unless they're genuinely interested. My brother could care less about this stuff, but if I tell him something is hoppy or an IPA or something, he gets the picture and runs in the other direction. That's all he wants, and I'm not going to force feed him information on hop terroir and the flavor wheel and my personal system for ranking how dank a beer's hops are. I generally don't use these broad words here when writing tasting notes, but occasionally one slips out, and I simply can't get worked up about it. None of these things are ridiculous, of course, and obviously these are popular topics to write about, I just can't get worked up about them. This perhaps explains my modest traffic here, as I rarely come down hard on a given controversy. In fact, for a guy who sez he can't get worked up over this stuff, I just wrote a bunch about it, so um. Hey, look below, beer! What do I get worked up about? Beer! Here's a few things I've had recently that I didn't take notes about because I was hanging out with friends, new and old, and didn't want to bury my nose in my phone because I'm not a total jerk. 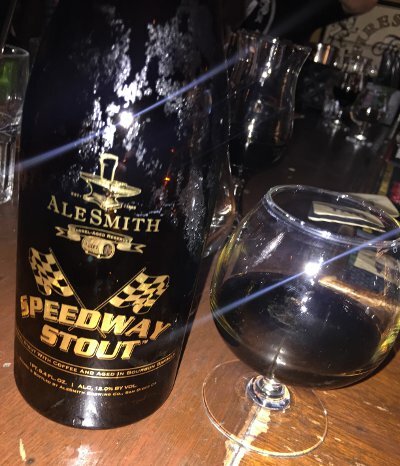 That's Alesmith Bourbon Barrel Aged Speedway Stout, which was spectacular (despite my legendary indifference to coffee) and de Garde Yer Bu, a delicious little Berliner Weiss that clocks in at a measly 2.5% ABV. Also of note was Tuckahoe Marigolden, an obscure NJ brewery making a pretty darn solid American Wild Ale. Literally everything else that was at there share was great too, but those were the standouts. Speaking of sharing, a friend was over recently and I decided to share some of the haul from my trade with Jay of the most excellent Beer Samizdat blog. This was a quite dank, powerful little DIPA, it felt like a light barleywine with a little age on it, quite nice. 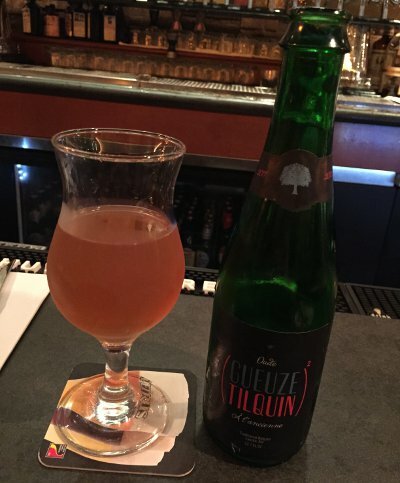 At a local beeratorium, I spied this Tilquin Gueuze Squared. Apparently created by accident when they inadvertently over-carbonated a bunch of bottles. They gave it some more time in barrels before rebottling, but that meant that the ABV had risen a bit higher than normal. Perhaps not better than your typical Tilquin Gueuze, but a happy accident nonetheless, and quite delicious! I've sung this underrated beer's praises before, and while it's not going to blow your head off, it's a great little pale ale, citrusy and quaffable. 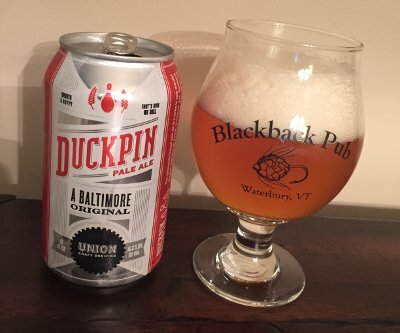 Worth checking out, and if you see Double Duckpin, definitely go for it! 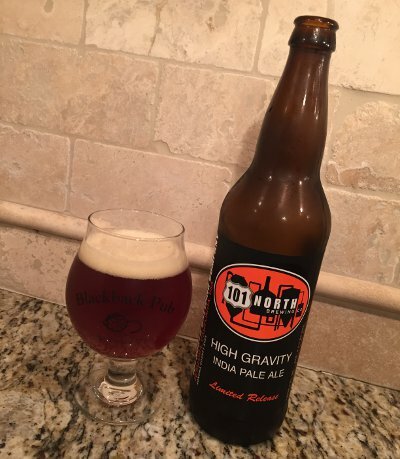 Beer Nerd Details: 6.8% ABV bottled (22 ounce bomber). Drank out of a flute glass on 8/29/15. Many thanks to Jay of of the right excellent Beer Samizdat for sending this to me (and if I recall, introducing me to Almanac in the first place, way back when). 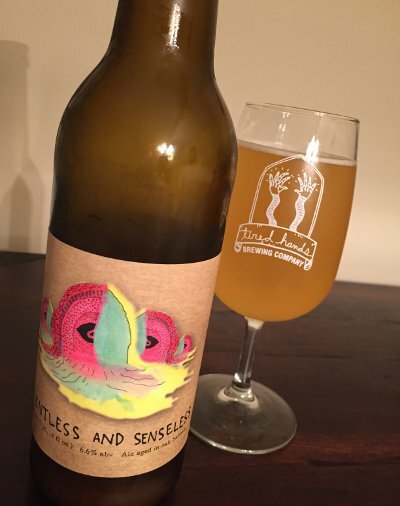 It's certainly on the same field as its competition and if these fellas were local, I could see cracking one of these every so often (just like I order up a glass of Shambolic every so often at Tired Hands), even if I find the Farm to Barrel series more eye-popping. Speaking of which, two of those in the pipeline, so keep an eye out (or, you know, protect them from the eye-popping awesomeness of those beers). 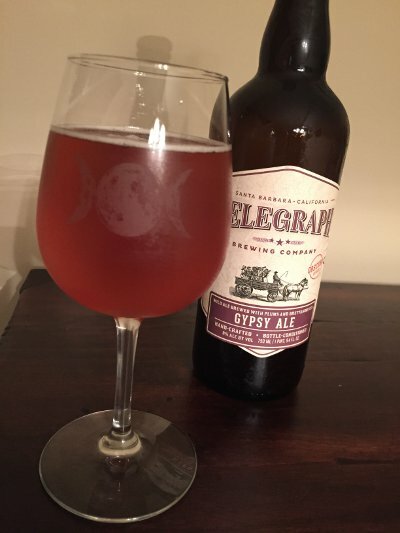 Our Gypsy Ale was born from a conversation at the brewery over some beers. Paul Rey, one of our brewers, has very eclectic musical tastes. He had some Roma Gypsy music playing one day and we got to talking about what a Gypsy beer would be like. Definitely wild, we thought, and rustic, with some less common grains, like rye. And we remembered a Serbian guy we know who, at parties, always pulls out these re-used plastic water bottles full of slivovitz plum brandy he brings back with him from visiting his mother. Since I have a big plum tree in my yard, it clicked. 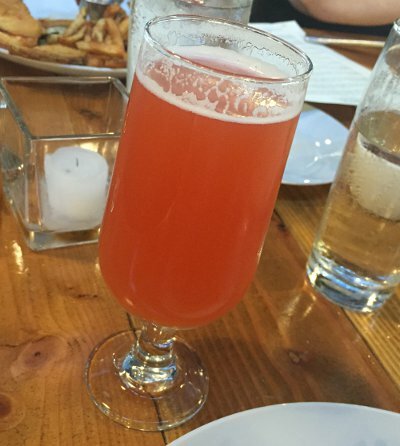 We would add plums to a barley- and rye-based strong ale, and age it with Brettanomyces. Well, sign me up... Opa! Beer Nerd Details: 8% ABV bottled (750 ml caged and corked). Drank out of a wine glass on 8/28/15. Vintage: 2014. What we've got here is a Double IPA from the bay area, clocking in at 88 IBU and 8.8 ABV, I think I sense a pattern. Looking at the can I see it is hopped with something called Omakase! I mean, I'm pretty nerdy about this stuff, but even I can't keep up with all the new hops these days. So let me google that for you and, huh, it's a term used in sushi dining? So, like, these nutty brewers put raw fish in the beer? Fortunately not. Omakase translates to "I'll leave it to you" and its frequent use in sushi restaurants basically amounts to letting the chef select a series of plates to comprise your meal (usually working from light fare to heavier, richer dishes). The application to hops isn't that hard to suss out. The brewers always brew with the same recipe, but they vary the hops as they see fit for each batch. Neat idea, though the lack of any identifying batch number on the can means it'll be tough to figure out what you're in store for. Still, small breweries are often shut out of long term hop contracts and thus have to deal with inconsistent supply. This seems like a playful way of dealing with that (or perhaps they just like the idea in general, why not?) So how did this particular batch turn out? 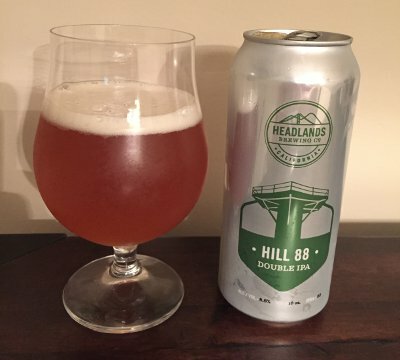 Beer Nerd Details: 8.8% ABV canned (16 ounce pounder). 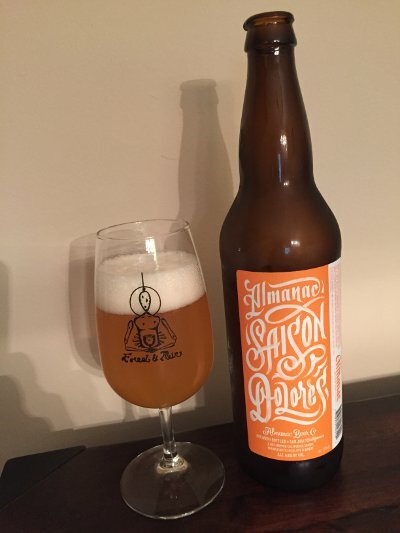 Drank out of a tulip glass on 8/28/15. Many thanks to heroic bay area resident Jay of the most excellent Beer Samizdat for sending this one my way. I'll have a few other ungettables from him in the near future, so stay tuned.